In “Sessions with Doc,” Dr. Patrick Cohn answers your sports psychology and mental training questions about How To Help Athletes Overcome Self-Doubt. Visit Peaksports.com and click on contact us to submit your question for Dr. Cohn to answer in his mental game videocast or podcast. Do you struggle with self-doubt before you go into competition? In this video I’m going to teach you how to deal with self-doubt so it doesn’t eat away at your confidence. 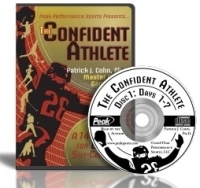 The information you’re going to learn in this video is a preview of my very popular program, “The Confident Athlete” CD and workbook program. How can you help your athletes overcome self-doubt? Watch the video below to hear what Dr. Cohn has to say about How To Help Athletes Overcome Self-Doubt. Don’t forget to subscribe to our YouTube channel to be updated on all our latest videos!